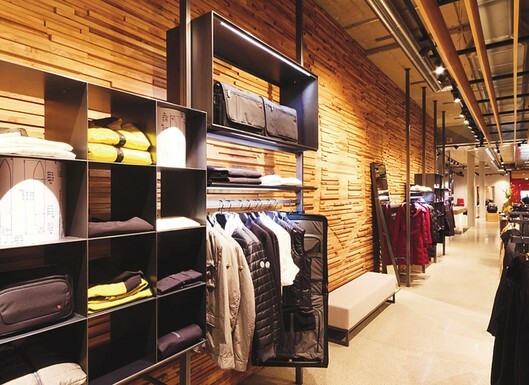 The Boston store will be modeled on the retail shop in Dusseldorf, which opened in January. The company that makes the must-have Swiss Army knife, Victorinox, has been busy repositioning itself as a sportswear brand for the last year. And now they’re ready to peddle to Boston. The company has signed a lease for 4,200-square-foot flagship at Copley Plaza slated to open in July, WWD reports. Led for the last 14 months by president of global fashion and retail, Joachim Beer, who was the former head of Hugo Boss in the U.S., along with a new design team, the brand has morphed into a full lifestyle collection, with a focus on technical outerwear. They’ll also be launching a seven-piece capsule collection in the fall designed by British label Raeburn. Named Remade in Switzerland, there will be only 100 pieces total, and will be produced from military surplus fabric, including old sleeping bags, parachute fabric, and Swiss wool blankets. Expect to see them in the new store come September.